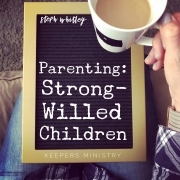 Every so often, I feel inclined to write about parenting strong-willed kids. I guess it's because I know how overwhelmed & exhausting it can be to parent a strong-willed child. Over the years, I have had to learn different tools to parent my strong-willed child.